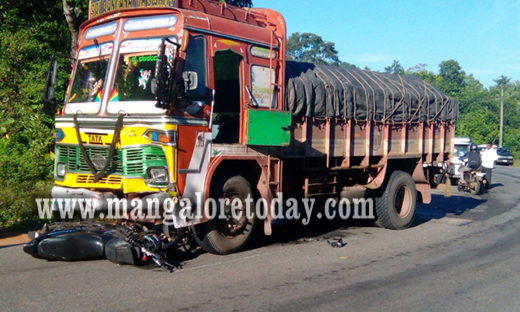 Bantwal Dec 2, 2015: Brothers killed after being hit by a sand-laden truck at National Highway near Gadiyar in Bantwal Taluk on December 2, Wednesday .The incident took place due to rash and the reckless driving of the truck driver is said. The deceased are identified as Ashik (26) and his brother Shafique (23). They were sons of Puttakka, Fisherman by profession. A resident of Kalladka . Ashik was working in Gulf. It is said that Asik and Shafique were plying from Uppinangady towads Mangalore on their bike. Sand –laden lorry coming from Bangalore to Managlore knocked their bike from behind. Due to the impact of the accident both died on the spot. The truck driver fled from the spot immediately after the accident .The locals expressed their rage over the driver and waylaid all the trucks. The bodies were taken to Government Hospital at Bantwal for post mortem. The Puttur Traffic police are investigating the case. So man loose life because of somebody’s mistake. There is no value for life. How sad,let God give strength and courage to the family.